::: Off the Radar :::: M.I.A. Brings it with Kala! M.I.A. Brings it with Kala! 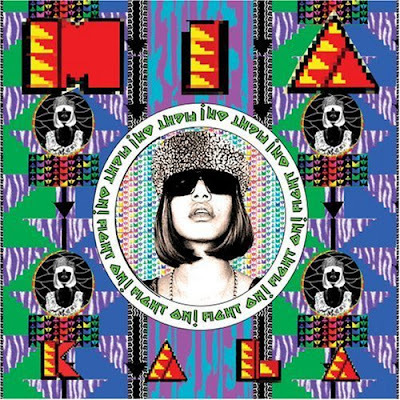 Just got a copy of the new M.I.A album 'Kala' which will be hitting stores Tuesday, August 21st! So far digging what I hear! I was a little worried that the new album might not live up to her debut 'Arular' which was a commerical and critical success and inspired many imitators. She was able to tap into a new sound/style that mixed middle eastern sounds/themes with hip hop, big bass beats and came up with her own unique style/niche. Artists like Uffie owe her big time for opening the doors. Except M.I.A. does it better! I'm digging that she's trying some new things on this new album. On Track #4 'Jimmy' she flirts with Disco and sounds like Dianna Ross straight out of the 70's. I love the fact that she's singing on this one too and not rapping. Sounds fresh and glad she had the courage to try something different. 'Bamboo Banger' starts the album off perfectly. Takes awhile to kick in but when it does it's a 'Banger, a Bamboo Banger!' Classic her with those middle eastern sounds/themes and similar messages of 'Power, Power...' We love that! 'Boyz' is outstanding as well and the single. We had that one on the Radar blog awhile back ago. Go back and grab that as well.